Now that I figured out how to get the picture onto the blog, I will try to copy the story. Time is a funny thing, passing quickly one day and barely moving another. On this particular day, in December of 2002, the clock ticked in slow motion. Jared Dan, the youngest son of four and big brother to sister Ashley was coming home from Taiwan, after serving two years as a missionary. All preparations for the excitement of the evening to come were done. The bedroom had been thoroughly cleaned from baseboards to ceiling fan. New sheets and pillows were on the bed. A cozy, manly blanket was folded across the foot and a new picture of a moose was on the wall. A cabin motif said, “Hello, welcome to your new space. We love you.” The minutes slowly ticked on. We were to meet the 6 o’clock p.m. flight from L.A. His brothers had ordered Triple P pizza to be picked up on the way home from the airport. Of course they had his nickname, The Bull, spelled out in pepperoni. The minutes ticked on. 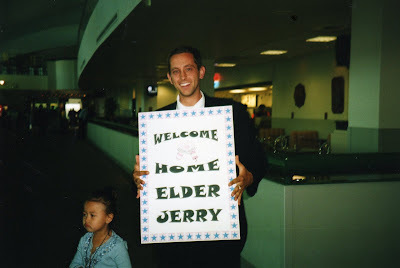 Carla, his babysitter from days of old was bringing the Welcome Home Elder Jerry sign to the house. We waited and waited. Amazingly, the minutes were now rushing by and the anxiety levels rose at about the same pace. After several phone calls and anxious conversations, it was determined that she had better meet us at the airport as the sign was not going to be finished by the time we needed to leave. His dad was much too relaxed for my levels of adrenaline and I began to pace about, nagging that we had better be leaving now or we were going to miss him getting off of the plane. At last, the minute I had planned to be out of the house arrived and no one could stop me from getting in the car and driving like a maniac to the airport. We arrived about the same time as the rest of the family and began waiting the last half hour of a long two years. Soon I would have my youngest beloved son in my arms again. My other three sons began to have some fun at my expense. About every 5 minutes one of them would say, “There it is mom, the plane is coming!” and I would cry, “Where, where, I don’t see it!” And everyone would laugh. I was biting my nails and snapping at everyone who came too close. Finally, the plane landed. Then I watched as each person deplaned, thinking the next one had to be the One. And the boys would say, “There he is, see him?” and I would say, “Where, Where, I can’t see him!” And they would laugh. The last 5 minutes were the longest minutes in the history of my life. And then, by some miracle he was there, walking to me. The family fell back and my little boy, grown into this wonderful, handsome young man, was in my arms and we were hugging and crying. I ruffled his hair and kissed his sweet neck. And it was as if he had been born again and laid into my waiting arms. Only better this time, because I already knew him. Carla showed up with the Welcome Home sign about 20 minutes after he arrived and I laughed. In minutes, we were home. I have been toying with the idea, for some time now, of using this space to record some stories. I thought it might be fun. Then I did some volunteer training for Hospice and one of our assignments was to bring a photo into class and tell the story of that picture. The next time we came to class we were to have written a memoir of that story we shared. The idea behind the exercise was to help us help those who are dying to tell their stories if they chose. What came out of that exercise for me was a desire to write. And where else better to do that than this little space that no one ever reads. That way I won't have to worry about anybody being too harsh with their critiqueing. Is that a word? Anyway, I am determined to give this blogging sport a try. This is the picture that I took to class that day. I titled the story "The Arrival"